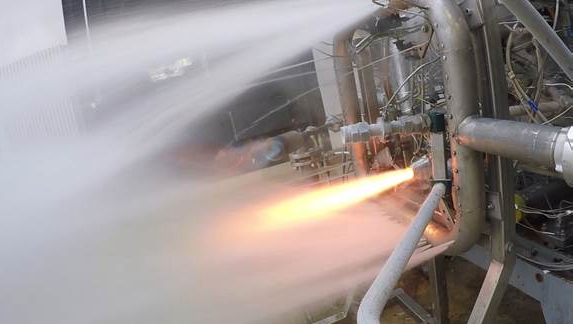 Quite an achievement ... at the one-year anniversary of having signed the Prometheus demonstrator development contract between the European Space Agency (ESA) and ArianeGroup, testing of the 3D-printed gas generator has started at the DLR site in Lampoldshausen, Germany. Prometheus is a European demonstrator for a very low cost reusable engine operating on liquid oxygen (LOx) and methane, and is the precursor of the future engines for Europe’s launchers by 2030. The aim is to be able to produce future liquid propellant engines at a unit cost which is 10 times less than the cost of building the Vulcain®2 type engine today. In order to achieve the success of a technological challenge of this nature rests on a completely new design and the use of innovative methods and resources in both design and production. In addition to a change in the traditional Ariane propellants (i.e., the transition from a liquid oxygen and hydrogen to a liquid oxygen and methane), the demonstrator will incorporate a number of key changes, including digitized control and engine diagnostics, as well as construction using 3D printing, in a connected factory environment. Alain Charmeau, CEO of ArianeGroup said that the success of the gas generator campaign as well as, compliance with the scheduled Prometheus design review date, is excellent news for the development of the European technologies of tomorrow and the future of Europe’s launchers. It is vital to demonstrate the pertinence of our technological choices, less than a year before the ESA Ministerial Conference which will decide the evolution of Ariane 6. The next major steps of the program are the completion of the subsystem tests and the start of production of the two demonstrators in the first half of 2019. Testing of the first two examples of this Precursor is scheduled on the P5 test stand at the DLR (Deutsches Zentrum für Luft- und Raumfahrt) in Lampoldshausen, starting in 2020. Prometheus is an ESA program, initiated with the French space agency Centre National d’Etudes Spatiales (CNES) in November 2015.